Shenanigans ensue when a little girl lets loose some very magical and mischievous figurines. 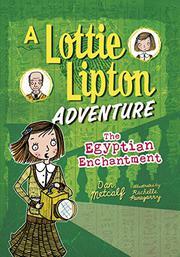 Lottie Lipton is a white 9-year-old orphan who lives with her great-uncle Bert in a tiny apartment in the British Museum. When the museum receives a 3,000-year-old Egyptian sarcophagus, Lottie helps her uncle, who works at the museum, unpack its contents. Inside, Lottie finds several little dolls. Uncle Bert explains that these are actually shabtis, small statues buried with wealthy ancient Egyptians, who believed the shabtis would come to life to do the deceased’s chores in the afterlife. Bert dismisses this as “poppycock,” but when Lottie recites the spell carved on one of the shabtis, the figures come to life and wreak havoc all over the museum. Armed with her trusty notebook, Lottie, assisted by Uncle Bert and Reg, the museum’s cockney-accented caretaker (his haitches drop inconsistently, however), must get them under control before some very rich museum donors arrive. The cartoonish black-and-white drawings show the impish shabtis in motion as they jump, wave their arms, and blow raspberries, thwarting Lottie’s every attempt to catch them. Metafictive elements include puzzles and riddles for readers to solve in order to “help” Lottie along the way. Backmatter includes additional puzzles, a glossary, facts about shabtis, and “notebook” pages. Companion titles The Scroll of Alexandria and The Secrets of the Stone publish simultaneously.